"What will (so and so) think?!" "I can't wait to tell EVERYONE!" "I don't dare tell ANYONE yet!" "Crap I don't want to gain weight!" Since I posted my first transformation with The 21 Day Fix during pregnancy, my inbox has just blown up with Mamas who are excited, scared, and feeling many of the emotions above. One of the biggest concerns is weight gain. Many don't want to gain weight - unfortunately, it's a necessity to keep that baby healthy and growing! But there are a few things you can do to stay healthy throughout your pregnancy and control your weight gain, so you can be the happiest and healthiest possible Mama for your little one. First, focus on GOOD quality nutrition. And when I say that, I mean, whole foods. Minimize the processed stuff that has added sugars and dyes and chemicals. Focus on eating foods with one to three ingredients - for example, for breakfast, have a bowl of oats with fruit and nuts. Doing this will not only nourish your body and help you to get the nutrients you need, it will also get your baby started off right! 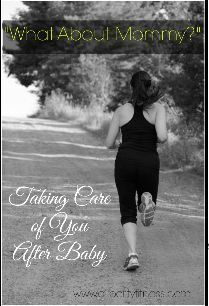 If you're looking for health and fitness support & encouragement with other pregnant or new Moms, join our private support group here! So just to be up front, you'll never EVER see me push this on anyone. But I can say without a doubt that my daughter (who is now two) is the most energetic, healthy, happy little girl. 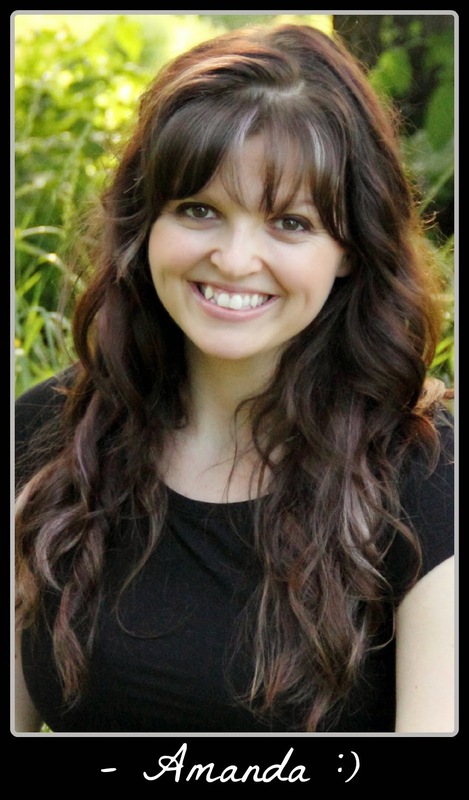 I had many MANY health issues during and after pregnancy (my family and I were living in toxic mold at the time! ), but one thing I did every day was I drank Shakeology. Out of the four of us, my husband and my little girl were the healthiest. It is AMAZING the difference between my daughter's health and my son's health. When I was pregnant with my son, I didn't drink Shakeology, and I ate lots of processed foods and dairy. With my daughter, I was dairy free, drank vegan Shakeology and strived to stay active and fuel my body with good nutrition. The difference is staggering and I truly believe Shakeology made a big difference in this (we laugh and say that Shakeology's nutrients went straight to her)! Side note: I did bring in Shakeology's ingredients to my OBGYN, who approved of the ingredients and said I should definitely drink it during pregnancy. I'd encourage you to talk with your OB as well and then reach out to me with any questions! If you're wondering about The 21 Day Fix and trying to decide if it's worth it, let me share this with you: I have done this program many times. Before pregnancy, during pregnancy, after pregnancy, and twice while trying to recover from a serious illness. It blows me away. Every Time. If you'd like to see what it can do for you AFTER baby, check out my results here! If you've already had your baby, and are overwhelmed, or in need of encouragement, you can check out this post for tips and even get 30 days worth of encouragement in your inbox daily, for free! Did these help you or do you have questions about a program? :) Message me or add me on facebook and we'll chat! Congrats, Mama! Hi, I'm Amanda! Mama of two and fitness enthusiast! I'm so glad you stopped by and hope you stay awhile! Don't Miss a Thing - Subscribe for Inspiration, Recipes, Fitness Program reviews and More! 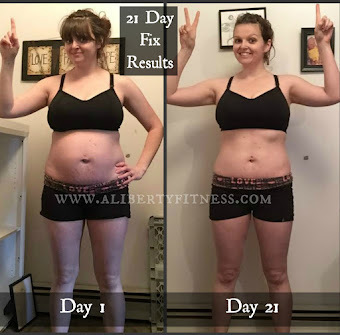 How Does The 21 Day Fix Work? Struggling As A New Mom? Get Daily Encouragement Here! and Make me Your Coach! Visit Liberty Fitness's profile on Pinterest. New Mom Trying to Lose the Baby Weight? 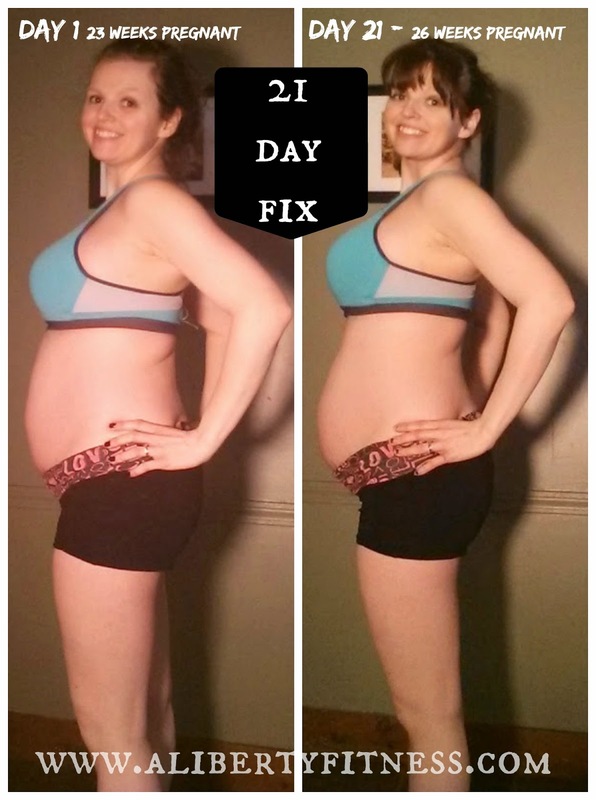 Can You Do the 21 Day Fix While Pregnant? With My Two week Progress Photos! Homemade Iced Tea - Simple & 21 Day Fix approved! My (5 Day) Cize Results So Far and a Quick Review! 21 Day Fix chocolate chip cookies - including allergy-friendly option! 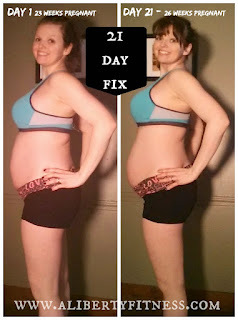 21 Day Fix While Pregnant - My Final Results and an Honest Review! 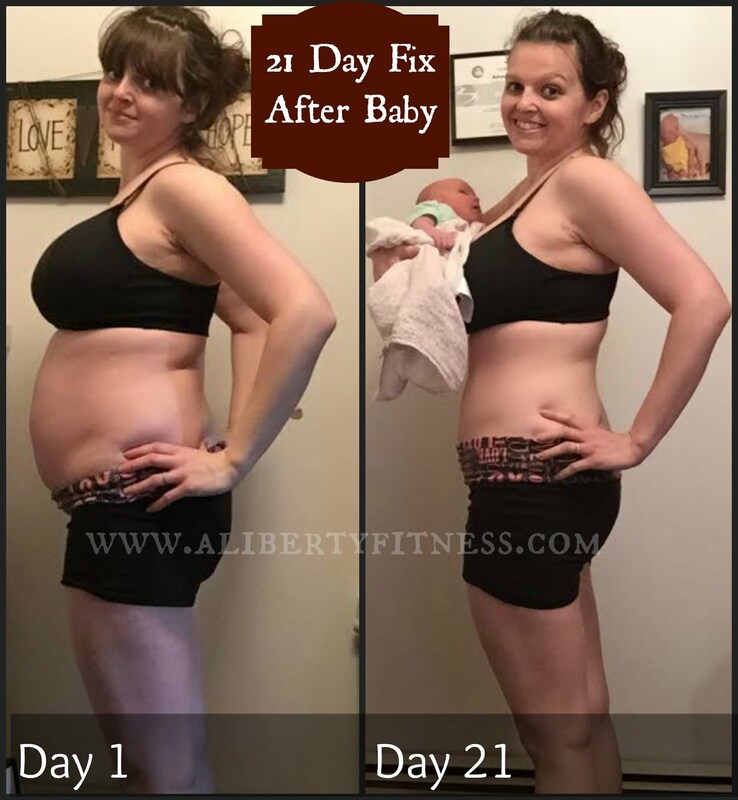 21 Day Fix After Baby - My Results and Review! 21 Day Fix for Busy Moms and How to Incorporate Your Portions Into Family Meals! Can You Do The 21 Day Fix Without the Containers?